Inclusive of Dive Manual (mailed to you) and Dive License Fee. If adding elearning below, Dive Manual issued electronically with video course material. We run courses 7 days a week, choose any start date. Important Note – The course is broken down into 3 sections, Theory, Pool and Ocean. Conducted via self-study manual or elearning. All elearning theory sections or Chapter Knowledge reviews in Dive Manual must be fully completed before starting Pool. Please allow 1 week minimum for this before starting Pool. 4 Open water dives require to demonstrate skills learned in pool under Instructor Supervision, but without Instructor in water demonstration. 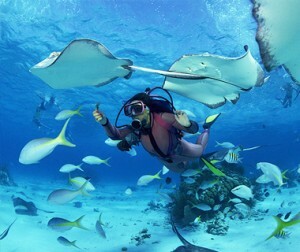 Discover Scuba Dive can be applied to 1st dive of open water if completed prior . Open Water Course can be completed in just 2 consecutive days with completion of theory/self Study prior. If you are somebody who’s utterly passionate about scuba diving, or someone who intends to become a professional scuba diver you need to undergo several levels of training to be able to get the certification needed for the desired skill you want to pursue. There are several diving organizations and courses that are geared towards the acclimation of specific diving skills such as PADI open water diver courses. The Basic open water course is designed for those who want a professional diving certification and a higher recreational experience. For people who occasionally pursues scuba diving and are doing it for recreation, a basic open water certification would be enough. From this course, aspiring divers will be taught the theoretical aspects of scuba diving which usually begins in a swimming pool to simulate open sea water conditions. The basic equipments needed for this course must be provided by the diving student which include fins and masks, and snorkel. 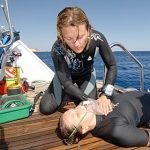 Gearing up the right way is very important to the success of your open water dive training. An economical choice for beginners would be the H2Odyssey Mask and Snorkel Combo that is retailed in child and adult sizes. As for the fins, we suggest the IST Talaria Split Fins for a glorious thrust and suppleness of movement. If you aren’t confident enough on your first training, try reading a PADI open water diver manual so you would know the basic things that you will expect for this course. For those who want more adventure and challenge, PADI certified advanced open water diving courses are available. This course goes beyond the PADI open water diver depth limits of a basic open water course. You may choose from a wide range of course choices to match your preference. You can choose from night diving as your specialization if you have interest for the nocturnal marine life, or take up cave diving course if you love the thrill of underwater caverns. For this type of training you may have to invest for your own scuba diving gear such as a wetsuit. Divers recommend the Aeris Rio 3/2 Jumpsuit for a flexible diving and efficient insulation in both warm and cold water temperatures. For this more advanced course it is recommended to download and read PADI open water diver manual PDF or a PADI open water diver manual eBook to be well versed about the underwater life and the dos and don’ts of scuba diving. In order to be considered a master scuba diver, you must acquire certifications in at least 4 other specialties aside from holding a record of numerous open water dives on your logbook. So if you are aiming for this level, train as much as you can and go on as many PADI open water diver courses. To be certified as a PADI Open Water Diver, you need to be at least 12 years old*, fit for diving, and able to swim. To be able to participate in the PADI eLearning Open Water online program, you simply need to be at least 12 years old. Parental Permission must be signed for all participants under the age of 18. *12-14 years old will be issued a Junior Open Water certificate upon completion of the program. They must dive with an adult certified diver at all times. The PADI Open Water Diver course is, by far, the world’s most popular scuba certification course. Millions of people have started diving as certified PADI Open Water Divers. Learning to scuba dive requires both knowledge development (facts, principles, concepts) and motor procedures (skills, techniques, methods). You develop the remaining skills by actually diving with your PADI Instructor at Expedition Dive. At Expedition Dive the PADI Open Water Diver Course is broken down into 3 sections. The full open water course takes two-three days to complete, with your choice of initial delivery either in a group classroom setting or the very popular PADI E-learning. This is followed by 1 day of confined water dives (pool practice) with a final day of ocean diving. Classroom theory is conducted at various locations across Sydney, with schedules available in the evening to accommodate working professionals. This portion is delivered by one of our certified PADI instructors, who will go over important fundamentals of diving in order to prepare one’s mind for the task at hand. 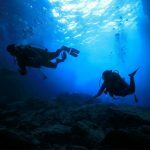 You’ll watch some short video demonstrations to get an idea of how to dive and its process’s, as well as go over some equipment basics and diving theory. Although the goal is to get you in the water ASAP to experience all the joys of the underwater world, there is still a certain level of information one must acquire to prepare for the experience of a lifetime! Proper preparation really does make for good performance! Duration: 3-4 hours, recommended self-review after session, prior to diving. The most popular way Open Water students are learning these days. Learn all the same information as per our classroom sections, except on your own time and at your own pace! The intuitive PADI E-learning screen combines video demonstrations and interactive online learning into a tool that encompasses the entire PADI Open Water Theory process. You’ll still have to do a final review with a live PADI instructor prior to your pool dives, but doing the theory in this way allows you to complete the PADI open water course in 2 days instead of 3. After completing all the required online sections, you’ll contact our booking line quoting your E-learning voucher, then schedule in for Section 2 of your course. Upon arrival for your pool section, one of our PADI instructors will conduct a quick review, answering any questions you might have and then spend a day of pool practice! With the convenience of the internet and online courses, PADI E-learning is really the way to go! After enrolling, PADI’s theory system presents with interactive presentations that include videos, audio, graphics and reading. Short quizzes let you gauge your progress, and review and correct anything you might happen to miss. This leads you through the program efficiently and after finishing the theory you’re ready to make the dive. Before you get to the ocean, you’ll have plenty of opportunity to practice in a calm controlled water environment. One of our PADI instructors will guide you through the process of taking your first breathes under water. 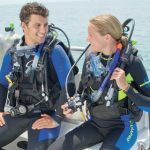 You’ll start by learning more about equipment, this time actually being able to identify and then put together a full Scuba unit, first by following demonstration then exclusively on your own. If you don’t get this part at the first, second or even third time, don’t worry, you’ll have plenty of time to practice! You’ll then take a break and go for a swim without scuba gear for the water skills portion. In order to become a fully certified PADI Open water diver, a swim and float test must be completed as a mandatory requirement of your PADI course. There is no time limit for this, and you may use any swimming strokes you want. After a short rest, your instructor will ask you to demonstrate that you can float on your own for 10 minutes (no touching the sides). The water Skills assessment is an important part to become a PADI Open Water Diver, as such you’ll need to be able to maintain yourself effectively in a water environment without scuba gear. Once this is complete, you’ll put on your gear, conduct safety checks with your buddy and enter the water for your first breathes under water! At every step of the way your PADI Instructor will guide you through the process of proper equipment preparation, checks and the key skills you’ll need to learn to dive confidently and safely. Now that you’ve had plenty of practice in the pool, it’s time to complete your ocean dives! On this final segment of your PADI Open Water diver certification, you’ll go over and repeat most of the skills you learned while in the pool with the added effect of an open ocean environment. The best part is, you’ll be able to experience and appreciate first-hand the awesome beauty of our underwater environment! Although there are certain skills to complete on each dive, you’ll have ample opportunity for underwater exploration while still under the watchful eye of your PADI instructor. During this process you’ll also be paired with a buddy as to perform gear preparation checks on each other before the dive and practicing buddy communications together during the dive all the while promote safe diving practices. There are a total of 4 ocean dives required for the official PADI open water certification. With each dive, brings practice and added confidence while getting use to how to move in an underwater environment through effective equipment usage. In doing so, you’ll quickly develop diving as a second nature skill and discover real reason why people keep diving, because diving is fun! By completing your PADI Open Water certificate with Expedition Dive; it is not only an accomplishment in itself, but opportunities abound meeting fellow divers while discovering a new activity that will bring years of adventure and excitement! Take advantage of our founding members price today! Powered by Web Fixers Au.